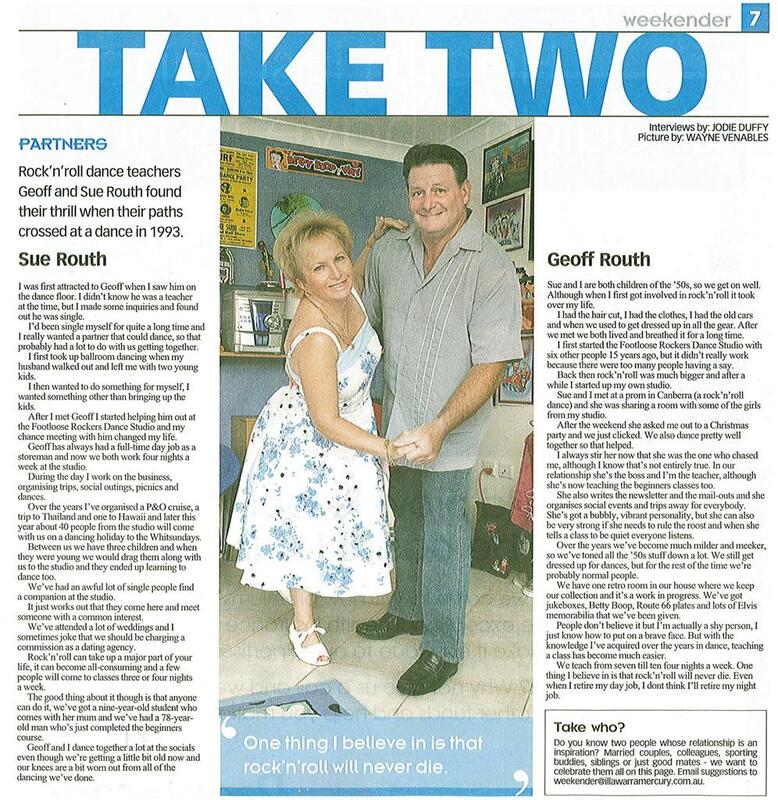 Geoff & Sue Routh have been teaching dance for over 25 years. As the principals of Footloose Rockers, their aim is to instill a sense of fun and vitality into classes and social events, in a relaxed and friendly atmosphere. Geoff & Sue who were married in January 1996, made a formidable team and quickly created a thriving dance studio which is now teaching around 150 people a week. They have also been instrumental in training people to teach, with quite a few of their students now having their own successful dance studios. In 1997 Geoff & Sue were approached to start teaching in the Wollongong area (about an hour south of Sydney). They started teaching at Pt Kembla Leagues and quickly opened in a succession of locations teaching 4 nights a week. Wollongong proved to be so popular they decided to move there in 2003 after travelling for many years. Geoff & Sue now teach solely in the Wollongong area, where rock n roll and swing are thriving. They organise a huge amount of social activities for their students including weekends away, picnics, ten-pin bowling, harbour cruises, not to mention regular social dances. They also host overseas holidays – check our HOLIDAY’S page for details on where we are off to next! ** Organised and choreographed 155 couples to dance at the Sydney Rugby League Grand Final in front of 93,000 people. ** Formed the Footloose Dance Troupe who have performed at many functions including Wollongong City Council Australia Day Celebrations, New Year’s Eve Fireworks Spectacular, Festivals, Street Parades, Weddings, Birthdays, Football games etc. We have also trained lots of dancers to compete in local and national dance championships, many who have gone on to win the titles in their grade! Geoff & Sue have brought many years of fun, entertainment and happiness to thousands of people ranging in age from a young 10 to a youngish 78 year old!